Sassy, beaded fringe ankle bracelet - perfect against a summer tan! This is so easy to do that you can make several in different colors. 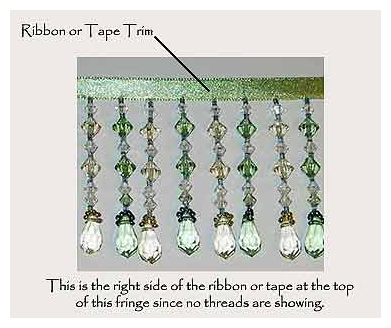 Definitely use acrylic beaded fringe, not glass beads for this project! The beaded fringe will fall down around your ankle, so make sure that you don't get a fringe that is too long or too bulky. Our Chic Collection is an ideal length for an ankle bracelet. Measure around your ankle, then add 1" - this is how much beaded fringe you will need. Double fold over one end of the ribbon of the fringe - you want to double fold it so that the cut edge of the ribbon isn't showing - and securely stitch all 4 corners of the folded ribbon down. Use medical tape to secure the folded and stitched edge to your ankle and wrap the unstitched side around until it meets the other side that is taped to your leg. Take a pencil and lightly mark (on the ribbon) approximately 1/2" past the other end. This will be your new fold for the other end, so you want it to overlap enough for the snap. Remove the fringe from your ankle and at the location of the pencil mark, neatly double fold the fringe's ribbon. Stitch all four corners securely at the fold. Before going further, try the ankle bracelet around your leg one more time to make sure that the ribbons overlap enough for your snap. Each of the ends will receive one part of the snap, so that when you are completed, one end of the ribbon overlaps the other and snaps closed. The snap itself should not show.